My time is very limited. As such, I can’t devote too much of it to the projects I want to tackle. After my next post, Daemons & Deathrays will take a couple weeks worth of break time. Part of that time will involve working on a large request I’ve wanted to do for a while now. All will find out soon. I’ll only drop the hint it involves one of my favorite settings and something extraplanar. Many have assumed that the Neanderthal was was to time itself, a relic of an ancient age. While most of them are long since gone, some have been isolated within realms quite literally lost to time! In these strange extraplanar realms, these archaic people thrive! That’s not to say countless adventurers haven’t embarked from their strange worlds into even stranger worlds that are far more alien. Your people have passed down countless legends of great hunters and powerful warriors that have even defied the grand spirits. This lore is passed down, inspiring you to be truly magnificent. While others view your lifestyle as simple, you are another legend in the making. Deep within isolated pockets of primal civilization, your strong and sturdy people thrive. Unlike the modern human, you are built to face the fearsome power of nature. While you may not be as wise or knowledgeable as most, you make up for it with impressive physique and endurance. While the journey ahead looks fierce, with few allies that will understand you; more that will belittle you as a throwback, a degenerate, a dated relic from a bygone age. Perhaps you were lucky enough not to be displaced in an incomprehensible time period. If this case, you are among your own people in a world all too familiar. But take heed, the eldritch spirits that have taken many of the lands surrounding yours may one day claim you next. 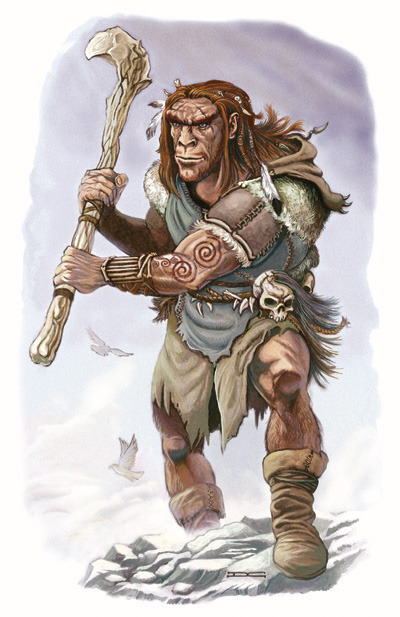 The Neanderthals bordering the frigid land of Vaas’ feir are a people ripped from their own long distant time zone by cosmic powers, placing them in the modern age of the realm. These Remanent of the old world try their best to adapt to a new world filled with fantastic contraptions and people looking far different from you. As one would expect, the Neanderthal face constant discrimination in their newfound home while being strained by societies they fail to adapt to… or at least not at the same pace the human citizens have.